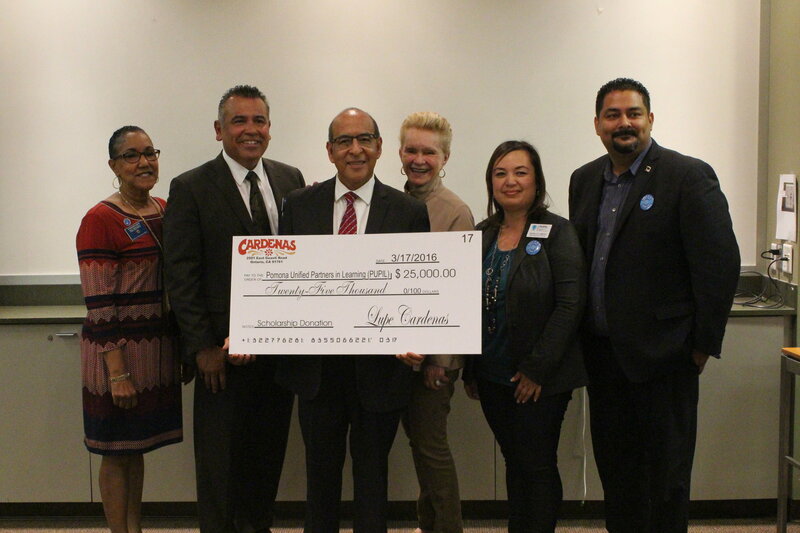 Pomona Unified Partners in Learning Foundation (PUPIL) is partnering with Cardenas Markets, which donated $25,000 on March 17, to strengthen Pomona Unified School District programs established to spark learning. Representatives from Cardenas Markets, which operates three stores in Pomona, presented the check to PUPIL with the goal of inspiring students to reach for their dreams, as owner Jesus Cardenas did when he immigrated to America from Mexico and started his first market in 1981. The donation will support the District’s science, technology, engineering, arts, agriculture and math (STEAM) programs and other learning opportunities. 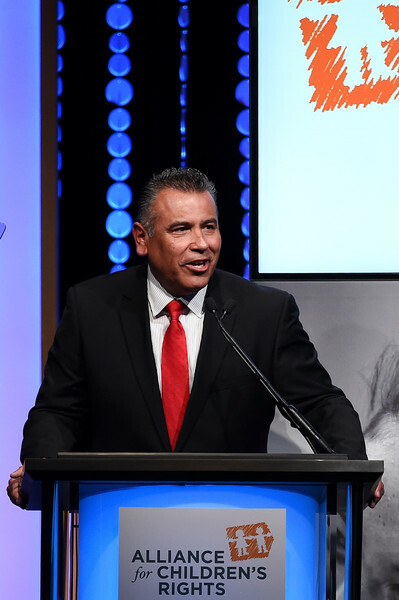 Pomona Unified School District Superintendent Richard Martinez on March 10 was recognized for his years-long advocacy for children’s rights with the prestigious Francis M. Wheat Community Service Award at the 24th annual Alliance for Children’s Rights dinner at the Beverly Hilton Hotel. Martinez was cited by the Alliance for being an education pioneer and champion of collaboration, urban education and foster children. The star-studded dinner, attended by a host of influential industry notables, is the Alliance’s biggest fund-raising event of the year. 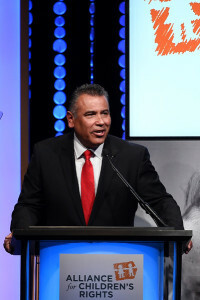 Past recipients of the award include Los Angeles County Supervisor Mark Ridley-Thomas, former LAPD Police Chief William Bratton, television producer Brenda Hampton and Echoes of Hope chief executive Stacia Robitaille. Thirty-six Pomona Unified students will compete in the 66th annual Los Angeles County Science and Engineering Fair from March 17-19 at the Pasadena Convention Center after an excellent showing of their innovative science projects at the District's Sarah Ross Science Fair. Additionally, four student projects each won a $400 Sarah Ross Foundation scholarship. 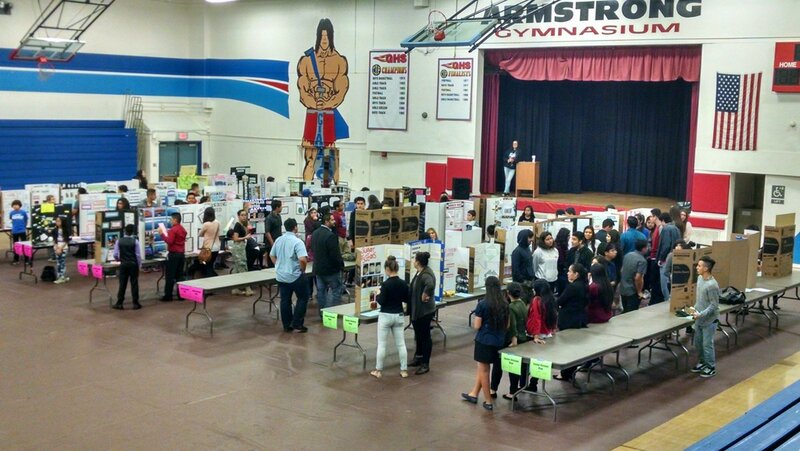 The District fair, held at Ganesha High School on Feb. 20, was sponsored by the Pomona Youth and Family Master Plan and its Promoting Academic Achievement Task Force, which partners with local organizations to provide stimulating scientific activities to Pomona students. Pomona Unified School District operates 20 elementary schools, five K-8 schools, five middle schools, eight high schools and five other schools. The district was formed in 1954 as a merger of districts dating back to 1871. Pomona Unified's Park West High School is among 37 high schools across the state designated as a Model Continuation High School. The schools are recognized for their innovative teaching approaches that enable students with diverse needs to complete their high school education. Park West Students benefit from the supplemental programs and services offered, such as independent study courses, career counseling, job placement, apprenticeships, and concurrent enrollment in community college. The school, which retains its title for three years, will be recognized at the 2016 California Continuation Education Association (CCEA) State Conference, held April 29 to May 1 in Riverside. Pomona Unified has won a preliminary $1.14 million grant from the State Board of Education to expand Regional Occupation Programs and Career Technical Education programs and add new pathways, bolstering opportunities for students to explore such careers as social services, law and public policy, and business management. The state OK’d $245 million in Career Technical Education Incentive Grants to 265 applicants that integrate academics with career technical and professional training, connect employers with schools and prepare students for jobs in high-demand fields. Follow-up Story: Pomona Unified Partners in Learning Foundation (PUPIL) is partnering with Cardenas Markets, which donated $25,000 on March 17, to strengthen Pomona Unified School District programs established to spark learning. Representatives from Cardenas Markets, which operates three stores in Pomona, presented the check to PUPIL with the goal of inspiring students to reach for their dreams, as owner Jesus Cardenas did when he immigrated to America from Mexico and started his first market in 1981. The donation will support the District’s science, technology, engineering, arts, agriculture and math (STEAM) programs and other learning opportunities. Pomona Unified’s dedication to bolstering digital learning and educating students on how to use technology responsibly has earned it recognition as a Digital Citizenship Certified District for 2015-16 by Common Sense, a national nonprofit that advocates for safe technology and media for children. Common Sense congratulated Pomona Unified for helping students become good digital citizens and avoiding social media pitfalls. PUSD’s digital citizenship curriculum is created in collaboration with Common Sense and Dr. Howard Gardner of the GoodPlay Project at Harvard Graduate School of Education. The free resources are used in more than 100,000 classrooms nationwide. Pomona Unified is one of 33 districts in the nation recognized as a District of Distinction by District Administration Magazine, the most regularly read publication for K-12 district-level school leaders nationwide. The District is being honored for its participation in the Youth and Family Master Plan, which created a cradle-to-graduation community education program to combat decades of student gang violence. The plan brings together administrators, parents, higher education, and community and health groups to ensure Pomona Unified’s 25,250 students have every opportunity for academic and social success. Follow-up Story: Thirty-six Pomona Unified students will compete in the 66th annual Los Angeles County Science and Engineering Fair from March 17-19 at the Pasadena Convention Center after an excellent showing of their innovative science projects at the District's Sarah Ross Science Fair. Additionally, four student projects each won a $400 Sarah Ross Foundation scholarship. The District fair, held at Ganesha High School on Feb. 20, was sponsored by the Pomona Youth and Family Master Plan and its Promoting Academic Achievement Task Force, which partners with local organizations to provide stimulating scientific activities to Pomona students. Follow-up Story: In the first step toward achieving an ambitious goal of 100 percent literacy within the city, Pomona Unified School District convened its first meeting of the Literacy Collaborative on March 7, urging a panel of community and business stakeholders to be ambassadors for a sweeping new educational program that will be officially launched in the spring. The Literacy Collaborative was developed as a result of the District’s new Strategic Plan, detailing how Pomona Unified will bolster student achievement. To promote technology and literacy, Pomona Unified in May will launch Footsteps2Brilliance, a mobile-based comprehensive literacy app that the District has introduced in a pilot program for preschool, transitional kindergarten and kindergarten students. The Collaborative will support the District in its launch of this new program to ensure it has a significant impact. Pomona Unified will host the EdTechTeam Los Angeles County Summit featuring Google for Education on Saturday, March 12 and Sunday, March 13 at Village Academy High School, 1444 E Holt Ave., Pomona. The high-intensity event focuses on deploying, integrating and using Google Apps for Education and other tools to promote student learning in K-12 and higher education. The program features Google for Education innovative educators, Google for Education certified trainers, practicing administrators and other solution providers. For more information on the program, visit ca.gafesummit.com/lacounty. 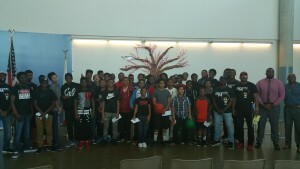 Follow-up Story: The Pomona Alliance of Black School Educators (PABSE) and the Pomona Unified School District recently hosted the seventh annual African American Male Summit, which provides students in grades seven through 12 with information on careers and offer students and their parents the resources and support to reach success. Attendees received encouragement from current and former PUSD educators, alumni and board members, as well as African American male professionals throughout Southern California.